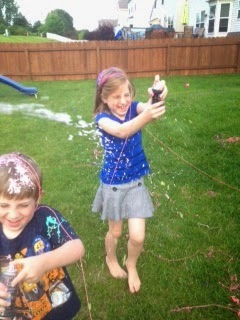 Who knew silly string could be so fun? After seeing many colorful cans of the stuff at the craft store last week, Addie asked if we could get them for her birthday sleepover. 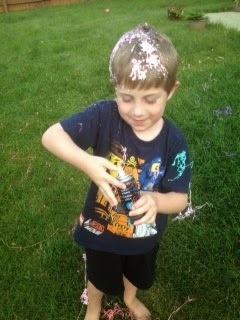 My initial reaction was the same I always give when the kids want me to buy silly string: “No way.” But, after a second thought, I reconsidered and starting throwing cans of it into our cart; you only turn eight once in your life, after all! Addie’s eyes lit up as she realized that I changed my mind, and she happily started helping. The girls at Addie’s party had an absolute blast with it. It was too much fun to watch them running around in the backyard, spraying each other with the colorful strands of gooey mess, and listening to them shriek in delight. 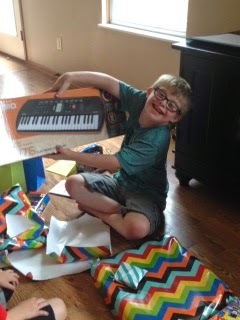 It was a great addition to her birthday celebration. Today, we found ourselves back at the craft store for another errand, and we discovered that the silly string is now on sale, 60% off! What else could I do but load up with 10 cans of the stuff (two for each of us in the family), and then after a split moment’s pause, I threw in four more cans to deliver to my niece and nephew (as we would see them later in the day). 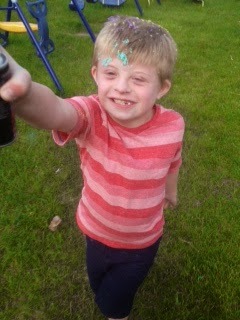 Once everyone was home for the evening, we launched the most epic silly string battle in our little family’s history. We had a ball, chasing each other down in the yard and taking aim, then covering everyone head to toe in the neon strings. We made a huge mess, but it was totally worth it. I’m hoping this is one of those special memories that the kids will hang onto as school begins and thoughts of summer drift away. We were fortunate today to spend time with our extended family. It was so fun to watch all the kids play together, hear their giggles, play baseball (that’s going to hurt tomorrow, ha! ), and just sit and laugh. With everyone’s busy family schedules, it’s difficult for all of us to find time to share these celebrations. I’m so glad when everything falls in place and we can spend an afternoon or evening together. I’m guessing the kids will sleep well tonight. Addie is celebrating her 8th birthday tonight with friends. They are such a well behaved group of girls! They are all getting along so well, and the house has been full of giggles all evening. This is day three of Birthdaypalooza 2014; one more day to go! Ugh. I was foolish enough to declare today Taco Tuesday before realizing that I am too stinking tired to put that much effort into making dinner. I tried to convince the boys that Mommy Mac was a better dinner choice, but they aren’t having it. My sweet Addie was willing to go for the macaroni, but the boys are revolting. So, apparently I either make the tacos or listen to the boys cry over the Taco Tuesday Fake Out for the rest of the evening. Decisions, decisions. They’ve already started the whining, and I really don’t know that I could listen to it much longer. Goodness. It’s like they expect me to put a meal on the table three times a day or something. (Be careful, or a little sarcasm might drip down onto your keyboard.) I guess I’ll haul myself into the kitchen and pretend to be domestically gifted. Wish me luck. We can probably all agree that Mondays are rough. Today was really no exception. Our typical household chaos got off to a quick start, and I soon found myself with only 20 minutes left to shower before our sitter arrived. Not a problem; with three kids, I am able to get myself ready to go in no time. With 10 minutes to spare, I stepped out of the shower, only to discover that there were no clean towels. Fantastic. And then the doorbell rang. Our sitter was early; panic ensued. I grabbed the last washcloth in the cabinet and frantically tried to dry off with that. Super fun. After using the world’s smallest towel, I threw my clothes on, grabbed my coffee cup, and went rushing out of my bedroom to greet the sitter. Before I made it out the door, though, I collided with Alex, who was running in to announce the sitter’s arrival. My hand flew up in the air upon impact, tossing a big spray of coffee straight up into the air, and I watched as it splattered on top of Alex’s head. Two thoughts immediately crossed my mind: 1) I am glad I don’t take my coffee extra hot (it was actually lukewarm by that point in my morning, thankfully! ), and 2) I bet that would have been hilarious to watch later had it been caught on video. Poor Alex just stood and stared at me, wide eyed, as I looked down and realized that miraculously, none of the coffee had landed on me or my work clothes. I quickly assessed the damage, silently praised myself for having already booked the carpet cleaners to come this week, and helped Alex take off his coffee soaked tshirt. Not having time to dwell on much of anything, we trotted down the stairs and moved on with our day. Somehow, I made it to work on time. My day actually went pretty well (until after work, anyway, when the boys got in a juice fight with a Capri Sun…oh, the sticky floors! ), and now I’m winding down my day and heading to bed. Hopefully, tomorrow I can enjoy all of my coffee instead of accidentally showering one of the kids with it. Let’s also hope that the coffee stains come out of the carpet!